Home & Office | International Medcom, Inc.
Ionizing radiation is an invisible co-factor in our lives and health. What can we do? There is a growing movement towards health-conscious living. Healthy food, exercise, sunlight (in moderation), and emotional well-being are all recognized as important factors contributing to our health and general well being. Yet sometimes there are invisible elements in our environment that we cannot be aware of with our human senses. Sometimes they can effect our health. Ionizing radiation is one of these. Experts, including the Biological Effects of Ionizing Radiation Committee (BEIR) of the National Academy of Sciences tell us that there is no dose that does not carry some risk (even if the risk is extremely small). The principle of ALARA (As Low As Reasonably Achievable) is applied to workers in the nuclear industry. It makes sense to apply it to everyone. Be aware of events near and far that could affect your accumulated exposure over time. Stress and fear are also co-factors that can effect health and longevity. Knowledge and information, on the other hand, can be empowering and reduce stress. Our instruments are designed to empower people with information that will help them live long, happy and healthy lives. 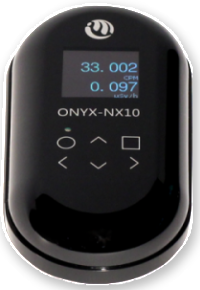 Onyx – Slim, elegant, beautiful, functional and sensitive – this instrument is also social media enabled and easy to slip in your pocket. Advanced features, great price, best warranty in the industry. Rechargeable with micro USB cable (supplied). Can hook up with your computer to upload recorded readings or to collect live data on a Chrome app. 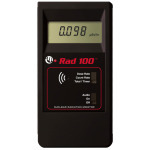 Rad100 – Very economical without sacrificing ability to detect mixed sources (alpha, beta, gamma and x-rays). 6 month battery life, high accuracy, 2 year warranty. 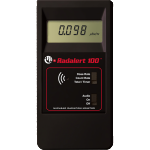 Radalert 100X – Economical but accurate and dependable. 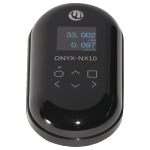 Detects alpha beta gamma and x-rays, and has an adjustable alert feature to let you know if something changes in your environment. 6 month battery life, 2 year warranty. Probes – Contact us if you want to monitor your home, office or outdoor environment continuously. We have multiple cost effective solutions to meet your needs.